ShipWreck Beach Bar & Grill, St Kitts. Still at South Friars Bay….and not moving any time soon! Enjoy the true Caribbean spirit while sipping an icy cold beverage or indulging in a Caribbean-style meal. The bar is open for liquid refreshment from 10 am to Sunset. A diverse variety of local cuisine is available daily from noon to 6.30 pm with our acclaimed “best fish tacos ever” well worth sampling. Relish an up-close experience with monkeys and mongooses. Live entertainment every Sunday from 4.30 (ish) to 6.30 (ish). This is the Caribbean after all – we are very laid back! Where do I tell the taxi driver I want to go? YES we are still in the same location, just ask your driver to bring you to shipwreck on the south east peninsula! Hi, Taxis charge $16us for up to four people or $4each for more than four. Do you take credit cards at the beach bar? Arriving on Monday!!! So excited!! YES we take visa, discover and master cards, sorry Not American Express. Hello, I heard you closed so a hotel can be built; this seems incorrect? Hi Mark, we are OPEN and in the same place….no one seems to know whats going on with any future build so OPEN is how we plan to stay! What is in the Green Flash? We were there last week and loved it. Hi! It has Blue Curacao, Coconut rum, CSR (cane spirit) and pineapple juice. Glad you enjoyed them!! Do you guys have a black sand beach? Our beach is a mix of black and yellow sand, the yellow is lighter and tends to wash in and out some days it looks more black than yellow and vice versa, just depends on Mother Nature! Our cruise will be in St. Kitts December 28. Look forward to bringing our crew of 5 over to the beach. Hi we had lunch in March 2016 we are returning March 2019 looking forward to joining you again, do you charge for chairs etc and is there some shade. Yes we have shade and we don’t currently charge for the chairs and shade, so long as you are using the restaurant and bar. Is it easy to get a taxi back to our cruise ship? It certainly is! You can either arrange a pick up with whoever drops you off or we can call someone for you, it only takes a few minutes for them to come. I will be there for a week in January…My first time back to the island in 8 years. I LOVED your place…was there five times. I had heard you were closed…happy to see that was wrong. Is there a day of the week that cruise passengers do not visit your place? Hi! Glad you’re coming back to visit! It depends on the week for which days can be busy with cruise passengers, but most days we’ve calmed down by 3! Sorry to be that guy but do you have Wi-Fi? Wishing everyone @ Shipwreck Merry Christmas & a Happy New Year ! We are looking forward to our next visit to St Kitts on April 9th 2019 . We are counting down the days ! 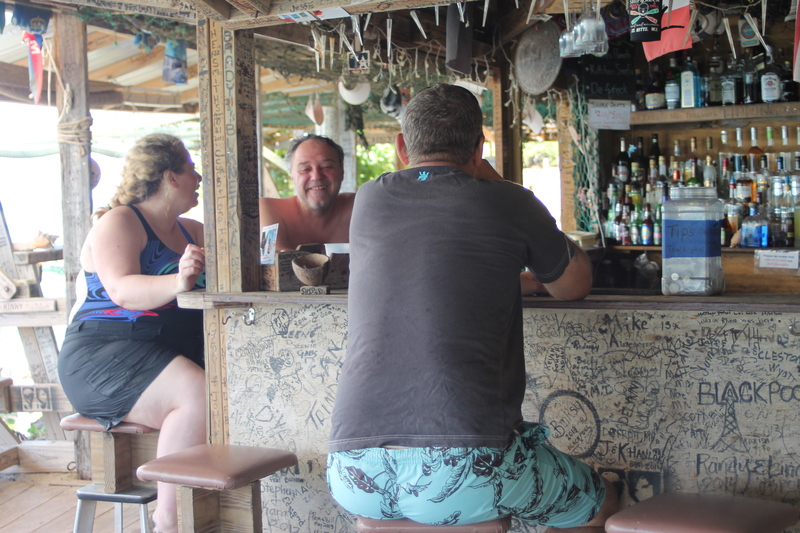 The Shipwreck Bar & Grill is my favorite beach / Bar on the islands. Great food, fun people, cold beer , & an awesome view. What else could you possibly want ? I will be coming the end of March ’19. I have celiac disease, do you have any gluten free options on the menu? Yes we do have gluten free options. Hi. I will be in Nevis in March and was thinking about a day trip to Shipwreck via boat. Is there a dock nearby? Hi, there is a dock down by Carambola at the other end of the beach, but most people that come by boat moor off and tender in. See you soon! Thanks. Hope to see you in March. How much does it cost to take a cab from the cruise port and how long does it take. Looking forward to seeing Shipwreck! Hi John, the taxi’s charge $16us for up to four people, it takes about 15mins max to get here and the drive out is nice ans scenic! How much money should we plan on spending there in one day. We are alcohol free people. Is there an all inclusive price? Hi Dean, we don’t have an inclusive price, I guess it depends on how hungry or thirsty you might be, virgin frozen drinks are $5us each but sodas are $2, food ranges from $3 for a hot dog to $21 for a combo rib and chicken meal. We also take cards if that helps. Do you have live music on Sunday, March 3 or any other time this weekend? do you have rinse off showers? Hi Bob, The taxis can pull right up and drop your mum, there are some chairs in the shade without having to go down the steps to the beach and there is a slope too which she may find easier although she may also need a steadying hand as there is no rail on the slope. On the distance thing no more than a 100yds. How much is a beer and do you sell domestic beer or just Island beer?? Hi We charge $3us for a local beer or a bucket of 6 for $15us……we carry corona and a US light beer (bud light or corrs light) depending on whats available, we charge $4for those…..
Sooo happy to hear that you all are still there! Absolutely love ShipWreck! Are the monkeys still there too?